We have released our first Testnet preview, StoneVan, on April 20, 2018. Our next code release will be Mainnet Preview in November. Currently implemented: our full Roll-DPoS consensus scheme with voting support. IoTeX’s long-term plan focuses on building IoTeX subchains, software development toolkits (SDK), and developer tools, as well as collaborating with IoT companies / developers to build DApps utilizing the IoTeX platform. IoTeX's mission is to allow developers to easily create their own robust and useful subchains for their own projects and ecosystems. Subchains are meant to be flexible, meaning they can choose to use their own tokens or the IoTeX token, can be programmed in a variety of programming languages, and can be made permissioned (private) or permissionless (public). If you have ideas or plans with regards to your own subchain or token, please reach out to us - we would love to help you design your own token economy! "Faster Dual-key Stealth Address for Blockchain-based Internet of Things Systems (icbc2018–9009)" has been accepted and published by one of the world’s most reputable academic blockchain conferences, the 2018 International Conference on Blockchain (ICBC 2018). This paper describes IoTeX’s enhancements to the already state-of-the-art dual-key stealth address protocol (DKSAP), which is used by projects such as Monero. IoTeX’s new protocol (named “DKSAP-IoT”) is an IoT-friendly adaptation of DKSAP, which reduces computational overhead by 50% compared to DKSAP, thereby paving the way for its application to blockchain-based IoT systems. This paper is accepted by CASCON 2018. CASCON is a premier industrial and academic conference for advanced studies in computer science and software engineering sponsored by the IBM Canada Laboratory. Hello IoTeX community! Good Job, LEO ! For all of us here at IoTeX, community is the most valuable asset and we take into account every interaction and comment seriously. As our technical development continues and our network of partners grows bigger with every day, we would like to invest into our long-term success and expand our community into different regions. As a part of this initiative, we are launching an IoTeX Brand Ambassador Program! We’re seeking talented people who will represent our project and communicate our technology, innovations and vision locally, internationally or at their universities. This is a exciting and unique opportunity to join a very innovative startup that is building a revolutionary infrastructure for the IoT industry. Spoiler: Why become an IoTeX Brand Ambassador? As an Ambassador, you will get unique access to communicate directly with our team and other Ambassadors and be a part of the project, where you can make an actual impact and invest into the success and growth of IoTeX, as well as receive resources and latest news and updates about the project and lots of other cool things. Among other benefits, you will be able to get access to the latest info/news, beta test new features, get exclusive access to our forum, corporate swag, token incentives and participation in contests and prizes. You will represent IoTeX in your local community — attend industry events representing IoTeX and organizing meetups to build local enthusiasm for the project. You will get to learn more about our project, technology, goals and community and help to educate and inform general public about the project. You will be able to contribute by managing communities, creating content and promotional material across a number of platforms. You will proactively and creatively seek out new opportunities for IoTeX to increase project’s awareness (marketing, community, partnerships, developers). You will help us to build a strong community of blockchain, crypto and IoT enthusiasts and developers (offline and online). Spoiler: Who are we looking for? Have a good understanding about our project, mission and vision. Be a great communicator, in order to motivate and inspire the community and public. Regional Community Managers: Lead and manage local groups using the messaging apps specific to your region. Social Media Representative: Spread awareness of the project by utilizing social media platforms and forums to engage with users. Business Development: Reaching out to potential partners on behalf of the project. Events: Researching & attending conferences and related events as an Ambassador of the project; organizing meetups and educational sessions in your city/region. Content Creators: Creating educational and engaging content (articles, videos, graphics) on various topics related to the project. Preferably someone with technical/blockchain knowledge. If any of these roles sound like an opportunity that you would like to pursue, please fill out a quick form and somebody from our team will be in touch for next steps. At the Trusted IoT Alliance summit in San Carlos, CA on September 5th, IoTeX’s Xinxin Fan and Larry Pang delivered a keynote speech on the IoT platform landscape and networked with representatives from the blockchain and IoT communities. As teams will be continuing to have more productive meetings and negotiations, IoTeX will be able to propose solutions for enterprise giants such as Cisco, in order to find grounds for collaboration on valuable services create together a service that will contribute, either to create a useful product, or to solve existing problems in their scenarios. Therefore, joining the Trusted IoT Alliance opens up great opportunities for demonstrating IoTeX experience, developments and products. IoTeX is invited to teach a distance learning course "Blockchain Technology and Applications”, as a part of Master of Science program offered by University of Nicosia, the largest university in Cyprus, Europe. Our co-founder Raullen Chain and staff blockchain engineer Zhijie Shen has presented to share the knowledge of blockchains and IoT to students all around the world. In May 2014, the University of Nicosia launched a first free, open-ended course of the MOOC (Massive Open Online Course), led by experts in Bitcoin technologies. So, any person from anywhere in the world who wants to learn blockchain technology can take part. November 2013 the University of Nicosia, the largest independent university in Cyprus and one of the largest English language universities in southern Europe, became the first accredited university in the world to accept bitcoin for tuition payments and to announce the development of a Master of Science Degree in Digital Currency. The MOOC will cover technical, legal, economic and regulatory issues related to bitcoin and digital currency and will be offered to students around the world for free. Digital currency MSc is designed to help financial and business professionals, entrepreneurs, government officials and government administrators better understand the technical basics of digital currency, how it is likely to interact with existing monetary and financial systems and what opportunities exist for innovation in digital currency systems . The degree is provided online to students all over the world, and the first course in the course “DFIN-511: Introduction to Digital Currencies” is available free of charge as an open MOOC course for everyone who wants to learn more about the fundamental principles of digital currency. The remaining 8 courses are offered at € 1,600 per course, resulting in a total tuition fee of € 12,800. The graduate program provides the basis for a doctoral degree. All students who successfully complete the program receive certificates from UNIC. On 11th November, Zhijie Shen and Raullen Chain will have a live session 21:00-23:00 Singapore time. However IoTeX are flexible of arranging a special, shorter session at your preferred time during 14:00-23:00 Singapore window. All of the selected candidates for this round, will be contacted by Monday, November 12th and we will advise you of the next steps. In case, if you didn't hear from us, we will save your application for the future rounds and you are always welcome to re-apply. Thank you for your interest and please stay tuned for more information! Ask us anything about IoTeX here from 11:00 AM PST to 1:00 PM PST on November 9, 2018! Points will be distributed no later than November 14. Visit the pinned “IoTeX Tech AMA — November 9, 2018” post in the r/IoTeX subreddit on November 9, 2018 between 11:00 AM — 1:00 PM PST. We will also post a link in the official IoTeX Telegram group when the campaign starts. *Note: We will only accept questions submitted within the official AMA timeframe announced here. Ask us a question and include your unique IoTeX Hash ID (PM@IoTeXBountyBot and enter /hashid, or follow the instructions here) — we will only give points for new questions (no duplicate questions)! We will answer the questions one by one in Reddit. If you have follow-up questions, please feel free to comment on our reply! We will also select the most thoughtful questions and give additional bonus points. We will transcribe the AMA and post the list of questions and answers to our Telegram group. Last night IoTeX visited CES Unveiled event in New York! Launch of Mainnet preview is right on track, e.g., subchain management and cross-chain communication has been implemented, security and reliability of Roll-DPoS has been improved and developer SDK and its doc are close to being done. IoTeX Network Explorer has been fully open sourced on GitHub! Working with iotex-core, this repo allows everyone to connect the existing node/port to a self-built Explorer and monitor blockchain activities at the front end! Since launching our Testnet Beta “Epik” release, we have been using Kubernetes to deploy and optimize our Testnet infrastructure. We wanted to share our experience and guide you on how to run your own containerized applications and environments on Kubernetes. You can connect your host or port to a self-configured Explorer and watch the blockchain in real time. You can see the open source code on our Github now. Finally, we have rigorously tested the IoTeX Testnet and have achieved 1,000+ TPS (with instant finality) and successfully deployed 100+ nodes using Kubernetes. Photon is named after Kenneth Thompson (Photon is composed of letters from “Thompson”), following the trend of naming IoTeX’s code releases after pioneers of computer science. Earlier this month, we gave our community the chance to propose and vote for the Mainnet Preview codename. We received over 12,600 submissions and out of five finalists, Photon was the unanimous winner with 27% of total votes. Thanks to all who participated! We will announce the full winner list soon tomorrow! Kenneth Thompson is an American computer science pioneer. He is best known for inventing several programming languages (e.g., Go, B) and operating systems (e.g., Unix) and received the Turing Award in 1983. As you may know, the IoTeX blockchain is coded in Go (co-invented by Thompson) — naming this release “Photon” is a tribute to Thompson’s work, which provides the building blocks for IoTeX to innovate today. In Photon, we preview some new technological concepts that will be fully deployed in our Mainnet Alpha release in Q1 2019. IoTeX’s goal is to create a blockchain that can support all types of Internet of Things (IoT) use cases — smart cities, supply chain, wearables, autonomous vehicles, and more. Although they share common requirements (i.e., scalability, privacy, IoT device support), each use case is unique and requires a tailored approach to optimize performance and security. To accommodate this diversity, IoTeX’s utilizes a root chain / sub-chains architecture that will allow developers to create custom sub-chains using the design that best suits their DApps. Applications will seamlessly exchange value / data with other applications via cross-chain communication. This is our vision for the future of IoT — a vibrant ecosystem of fit-for-purpose and interoperable sub-chains powered by IoTeX. Over the past two months, we have developed several in-house innovations which bring us closer to our vision for the future of IoT. The core features of Photon, which we detail in the following sections, include sub-chain provisioning, cross-chain communication, consensus (Roll-DPoS) enhancements, and IoTeX Explorer v2.0. Through exhaustive code reviews / “quality weeks”, we have greatly enhanced the stability of our smart contracts, wallet, and existing code base. In Photon, we introduce our FIRST root chain / sub-chain pair, which are separate, homogeneous blockchains running on separate databases. You can preview these features and test the deposit function in the new IoTeX Wallet now. Step-by-step instructions to create your own root chain and sub-chain wallet are provided above, and you can find a demo in our Photon overview video. In the coming weeks, we will launch several community reward programs to allow our community to further test this functionality and explore our root chain / sub-chains architecture. On the performance side, we reduced block production time (i.e., latency) by 30% from 10 to 7 seconds. On the security side, we implemented distributed key generation, a major security improvement to dual key generation that was implemented in Testnet Beta “Epik”. In a staging environment, we were able to achieve some amazing results — more than 1,000 TPS, 1 second latency, and support of 100 delegates. By the time of our Mainnet Alpha launch in Q1 2019, we expect to achieve our current peak performance results with full stability. Code Contributions — We Want Your Help! As we enter the holiday season, it is a great time to reflect on this past year, share moments with our loved ones, and thank the people who have helped us on our journey so far. It's been an amazing and successful year for IoTeX - raising our private sale, listing on global exchanges, launching four code releases with game-changing innovations, and growing our team to 25+ all-stars. It has truly been a year of building, and we have enjoyed sharing our progress with you. The most exciting part is the best is yet to come. The next few months will be action-packed, and we are a few months away from our Mainnet Alpha launch. We are excited to launch new developments we have shared on our roadmap, as well as some amazing things we have been working on behind the scenes. The future is bright for IoTeX, and we are committed to transforming the blockchain & IoT industries in 2019 and beyond. All of this is made possible by our amazing and passionate team and community - the pioneers who believed in our vision, values, and technology. We appreciate your help, support, and belief in IoTeX. This holiday season, everyone here at IoTeX wants to thank you for being the incredible family that motivates us to work hard and endure the long nights. We extend our best wishes to your families and loved ones -Happy Thanksgiving! Hi Simone, please introduce yourself a bit: who are you, what do you do? Hello Fabrizio, and thank you for your interest in the IoTeX project! I am 41 years old, and have always been passionate about computer technology. I graduated in Computer Engineering specializing in Automation and Industrial Robotics, then my professional career followed a more “industrial” path that IT, though in a very innovative sector. For the latest 10 years, I have been working at my own small company where I design advanced automatic machines, which perform quality control on 100% of the products in a producion line. In short, I provide manufacturing companies with machines equipped with digital cameras and image processing software: those machines “inspect” and “evaluate” all the pieces that are produced, rejecting those which do not comply with the specifications. In the same field I also own several industrial patents, both Italian and international. How did you approach the blockchain and IoTeX world? Since I deal more with automation than IT, I came to know about this technology quite late: only at the end of 2017, when it was newrly impossible not to hear about blockchain! Since then the blockchain captured me: I began studying whitepapers, and reading source code. A few months later, in April 2018, one person asked me for a technical opinion about this new project dedicated to the Internet of Things, IoTeX. After a few days spent in the IoTeX official Telegram group I immediately realized that was something “different”, not only because the technological solution they proposed seemed perfect for the IoT, but above all for the professionalism, accuracy, and the strong academic footprint of the team. These functions are critical to build networks of autonomously coordinated heretogeneous devices, and they cannot be natively implemented in IOTA, because it lacks the concept of global consensus. For example, privacy and smart contracts in IOTA will probably be developed as second level solutions (e.g. QUBIC, MAM): this means that they are applications, or SDKs, which make use of the IOTA ledger, but that are not imposed by a decentralized and unchanging consent mechanism. In one case (MAM), the problem of user privacy is not solved (the data of the users remain in the hands of the device manufacturers who can still decide not to use MAM, or do not have the knowledge to use it, moreover does not hide the sender/receiver identity, only encrypts the data sent). In the other case (QUBIC) the security and features of smart contracts that are supposed to be provided are still to be verified. There will be a time when a partnership with these multinationals will make sense, but to get there IoTeX needs lean partners first, those who share the same vision and the same timing, creating working prototypes that show a real functional value quickly. In addition, with the recent release of the IoTeX Explorer source code, with the imminent arrival of the Alpha Mainnet, and SDKs, I would like to invite interested developers to test it and start building applications on IoTeX right now. I would also like to form a community of developers: every idea and contribution is welcome — you can contact me directly on the Italian IoTeX group , where everyone is invited to join! The campaign will start from 12/03/2018 5:00 PM PST to 12/07/2018 5:00 PM PST. Detailed instructions will be updated here when the campaign starts. Please note that this is not a first-come-first-serve campaign. Please take your time to participate! We are excited to announce that the IoTeX Testnet is fully open to the community! Using our new software development kits (SDKs) and step-by-step developer documentation, anyone can easily start their own Testnet node, run transactions, deploy DApps, and much more. We can’t wait to see the great things you will build! Starting in Jan 2019, we will enable block producers to produce and verify blocks on the IoTeX Testnet. During this time, we will also disclose block producer (i.e., supernode) and staking requirements, as well as introduce the first group of block producer candidates. After Mainnet Alpha is launched, we will incrementally add more block producers and scale the network throughout 2019 to ensure the stability and security of the network. In our last blog Blockchain’s Role in Today’s IoT Landscape, we explained how blockchain will revitalize innovation in the IoT industry and unlock new capabilities. Now, let’s take a deep dive into the multiple layers of the Blockchain & IoT tech stack and describe how these layers ultimately come together to form end-to-end IoT solutions! Our Roll Dice Campaign has finished! Thank you for those who joined our tech AMA and livestream session on December 7th! We had a great time answering your tech related questions and talking about our technical progress so far and we would like to provide a brief summary for those of you who weren’t able to join, as well as, below you will find the questions that were chosen by the team and qualified for bonus points. Our Head of Cryptography, Dr. Xinxin Fan attended this conference and got insights on Commercial & Open-Source Implementations, Software & Silicon, Vectors & Security, Applications and Accelerators, Simulation Infrastructure and much more with the industry leaders! Invited by New Do Venture, our co-founder Raullen attended WDAS 2018 hosted by IoT block, as the guest speaker at the Investor & Founder Panel discussing “Sharing Economy: A Testbed for Blockchain, IoT and Decentralized Governance” along with Origin protocol and Bee Token. Hello everyone, last week developers team publicated IoTeX testnet, it is an IoT centred blockchain. The iotex-core is packaged into a docker image. So you must have docker into your 64bit system. I create a github repository to deploy a full node quickly. IoTeX is proud to join China Mobile IoT Alliance, a joint union of technology companies and enterprises focused on bringing frontier technology, products and solutions to the IoT industry! China Mobile is the largest mobile telecom corporation and the world’s largest mobile phone operator. As the first and only blockchain company which was invited to join the alliance, IoTeX will focus on bridging the blockchain technology with real world use cases. IoTeX will sponsor and partner with the University of Cincinnati to build a joint research and development laboratory, which will focus on privacy-preserving cryptography research and blockchain applications. As a privacy-centric blockchain, IoTeX has developed innovative blockchain privacy protocols (DKSAP-IoT) and will work with University of Cincinnati researchers and professors to further drive cutting-edge blockchain privacy research. It is planned as a permanent company that will start every Sunday. *Please note, one participant can either win IOTX or a hoodie. *We will announce and contact the winners by January 5. As a holiday gift from our team, you will have a chance to receive an exclusive gift — IoTeX hoodie that will keep you warm this winter! Q1: Lately I’ve noticed that there are many superb tech events to which IoTeX is the only blockchain project to be invited back-to-back latest being China Mobile IoT Alliance. That is very huge and may be overlooked by many as being the first and only means huge advantage in competition. How exactly does IoTeX continue to deliver on these things periodically in respects to as much as CAN be said? A: Thank you! We are very honored to be the first and only “blockchain” company to join the China Mobile IoT Alliance. Our contributions will follow two directions. 1) contribute to technical and academic expertise and resources 2) More importantly, we will work with the other alliance member for real proof and concept, use cases, and commercialization of the blockchain for the Internet of Things industry. This alliance has members covering various IoT verticles and they are all very valuable resources and potential partners of us. During the quarterly meeting, we will sit down with the members and discuss the practical ways to target specific use case scenarios and and the real-life solution. It may take a lot of efforts but we will lead the blockchain application side to push the development progress. Q2: Will IoTeX Blockchain support human readable accounts beside addresses like for EOS? And do you expect IoTeX blocktime could be as fast as 0.5 seconds? A: On the root chain, we plan to use the raw address derived from EC private keys. Human readable account and account management is a platform-level feature, not an infra-level feature, that can be easily implemented at contract level (btw, IoTeX will come with some native contracts). For example, Ethereum has ENS which is, tho not as popular as, similar to EOS’s account management. The problem of natively integrating an account scheme into the blockchain is the sacrifice of extensibility — I believe different account schemes would be needed for different scenarios/applications. In terms of the blocktime, I’d against to have it as small as 0.5sec for two reasons. 1. A normal RTT for a request/response over the internet is >500msec; producing a block within 0.5sec basically means the BPs need to be directly connected over a private or semi-private network, which introduces lots of concerns about centralization which IoTeX wants to avoid; 2. Producing block too fast introduces security risks such as EOS got attack few days ago. If we really want to make it fast, we need a subchain, e.g., in the form of a plasma chain, that could be a bit centralized but collateralized enough stake for users to build trust upon. Definitely being fast is not the priority for the root chain; safety and reliability are. Q3: Hi, I started study IoTeX recently and so I wanted to study the Go source code (iotex-core). I found that it includes 2 closed source components (libsect283k1 and libtblsmnt) and that, currently, they are only builds for ubuntu (x86_64) and Mac OS X. Analyzing the first one I see that it calls functions like blake256_hash, ECDSA_sign, schnorr_verify so it seems it’s related to signature handling. Did you planed to release the source code of that components (so “paranoids” can be sure there are no cryptographic backdoors)? If yes, when? A: The two crypto libraries handle the cryptographic protocols used in the IoTeX blockchain. The source codes of those libraries are being reviewed and improved internally at this moment and will be released early next year before the mainnet launch. Q4: Will the team be able to handle the large scale of IoT really? We’re talking what could be millions of devices, are you guys taking into account like network overhead and bandwidth requirements for nodes fully? A: Yes — we are committed to creating a protocol and environment that can support the entirety of the IoT industry. Unlike other blockchain platforms / protocols that are designing for general purpose use cases or other specific use cases (e.g., finance), we have made upfront design decisions for our blockchain to tailor fit it for IoT. We use lightweight cryptography to reduce the footprint / storage requirements for IoT devices (e.g., gateways / routers that connect to smaller sensors) running our blockchain protocol. We built our in-house Roll-DPoS consensus mechanism because DPoS is the most scalable consensus scheme right now. And we have a sub-chains architecture that allows for “separation of duties” — in other words, each sub-chain performs specific functions which do not affect the performance of other sub-chains. These are all design decisions that come together to fulfill the requirements of global IoT. One misconception is that ALL data from IoT devices will need to be stored on the blockchain. IoT devices today are getting smarter and smarter — they are able to process data locally (e.g., data validation, light analytics) to reduce the amount of data that must be sent to the Cloud / blockchain. This is called edge / fog computing. When paired with blockchain, this allows for the most critical data (i.e., results of analysis, state change data) to be stored on the blockchain, while other data is processed outside of the blockchain. Q5: A Kondratieff Wave is a long-term economic cycle believed to result from technological innovation and produce a long period of prosperity. For example before the invention of the internet there was an economy downcycle and it is believed that inventions in Information technologies spurred the rally up for few decades and economy of the world was growing at a fast pace and 30 years from then economy collapsed during the 2008 crisis. After that shortly bitcoin and blockchain was introduced to the world. What do you think: is it coincidence or blockchain and in that regard IoTeX as well will be the next stepping stone marking the beginning of the new Kondratieff Wave and bloom of world economy? A: Very interesting question — this is something that we think about a lot. The world is changing extremely quickly — in developed countries, we are seeing the start of the “third industrial revolution” that is transforming how we power our society (i.e., renewables vs. fossil fuels), communicate (i.e., digital / social), and consume (i.e., [blank]-as-a-service). In non-developed countries, mobile-based technology is emerging and “leapfrogging” the traditional banking systems (check out M-PESA from Kenya). The theme in both developed and non-developed countries is transparency, automation, and trust — this is where blockchain will shine. Blockchain will create entirely new engagement models across several industries — we are already seeing it in the financial space, and we believe 2019 will be the year when blockchain & IoT really skyrockets. Q7: Quite an interesting thing is that financial market strength of Iotex is correlating with resillience of the network because if price of Iotex token appreciates it starts to get more economically inefficient to attack the network and this perfectly alligns with Iotex investors’ reachabilities. What are the plans of the team to achieve this parallel goal not from the technological point of view? A: You mention a very important point about blockchain protocols — the more “stake” in the network, the more resilient the network is due to removing the “nothing at risk” concern. Much of this is actually enabled by choices in the design of a consensus mechanism. By this, we don’t mean simply choosing DPoS or PoS or PoW, but even more granular, such as determining who is elected to produce blocks (i.e., voting in DPoS), what the rewards are for producing blocks, and . We aim to balance fairness so that block production is not centralized (i.e., Pareto distribution, 80/20 rule) as well as incentivizing block producers to continue to stake tokens. Along these lines, we have been designing and testing our consensus mechanism at an extremely detailed level, as well as observing other projects’ design decisions (especially other DPoS and PoS projects). We see many flaws in the balance of power in other projects (see example: https://cryptogo.de/en/lisk-the-mafia-blockchain/),and will make sure that our protocol is fair to investors, block producers, DApp developers, and users. Stay tuned for more announcements on our process! Q8: Lately you have become part of the IoT Alliance mobile china. It is very nice to see how much this project is gaining importance in the Blockchain and IoT fields. Those who follow the telegram groups regarding cryptocurrencies know that IoTeX is a name that lately appears more and more frequently in chats all over the world. For this reason, I ask you if you intend to take advantage of the moment favorable to you and increase your marketing investments or do you prefer to focus on product development? In your plans there is also the idea of proposing a listing at some Exchange? Not all the world’s population has enough money to buy IoT products. Are you planning to do something to bring technology to even the least developed countries? A: Great question! Under the current market, we are sad to witness that some projects have left us or have fewer updates about the development progress. There are many reasons we don’t know behind the scene. As our early supporters know, we have a very detailed and ambitious roadmap and we always deliver on or ahead of time to keep pushing our progress to move forward step by step. Financially, we have also reserved enough fundings for the future 3–4 years development. It is a great time for us to do some precipitation (improving and revising the current code we have) and focus on our use case/DApp/product development and real partnership along with our coming Mainnet Alpha stage. In our opinion, the marketing investments will perform better when we have actual progress. As for the “buying IoT products” — we can see it at a higher level. The IoT devices can be not limited to the general smart home, wearables, smart cars… It can also be smart machines in various verticals such as logistics, agriculture, energy, off-site verification system, etc. As an end user, we may not have the chance to see and use them directly, but they are largely used by corporations and ultimately benefit our everyday life. And these machines will also be widely used in those less developed countries. Many of our partnerships focus on this side. Q9: Do you have future plans to change from Roll DdPos to yet another type of dPos? A: You should think about DPoS as a family of consensus mechanisms — all DPoS schemes are similar, in that a voted committee of delegates produces and validates blocks, but apart from that most DPoS schemes are very different. For example, EOS uses a concept called “approval voting”, where any token holder is able to vote for 30 validators. If the token holder has 100 EOS, then all 30 of the BPs will get 100 votes (not 100 divided by 30). From our point of view, this is a recipe for collusion, as the top 21 token holders can all vote for each other 21 times and block out other potential BPs. IoTeX (and other DPoS schemes like Tron) do not use approval voting. This is just one example of the nuances of DPoS and consensus mechanisms in general. Like other projects, we will be bootstrapping our network when our Mainnet launches, and will make adjustments to our consensus mechanism throughout 2019 to optimize performance and fairness. We will be unveiling the full details of our block producer requirements (e.g., HW/SW, ops, stake), block rewards, voting process, etc. in the near future. Q10: do you think your technology will significantly improve carsharing, which is now gaining momentum. will you be able to improve this market and bring your technologies and ideas to it? I read your news, tell in more detail about technology of the intellectual parking which allows operators of the parking remotely and to automatically keep track of employment rate of the parking in real time? whether you have competitors in this direction? A: The Auto industry is a huge opportunity for blockchain & IoT. As more and more software is being put into cars (e.g., Tesla now has over-the-air automatic updates for their cars), the data gathered from cars as well as the data sent to cars must be fully protected. This is a huge deal — Elon Musk often says the biggest risk to Tesla is if someone is able to deploy an OTA update to the entire fleet of Tesla vehicles, which could take over control of cars. Blockchain will play a very important role in gathering trusted and shareable consumer data from vehicles (for use in insurance / compliance and data marketplaces) and also how cars consume new information. A parking / smart city solution would utilize a combination of IoT and blockchain technologies. On the IoT side, RFID/NFC technology will likely be used to have cars communicate with infrastructure (e.g., parking meters), while blockchain will be used to create a foundation of trust between drivers and the city. Once this foundation of trust is established, multiple parties will be able to transact in a trusted way. This will lead to automation opportunities, such as fully automated “park and pay”. Q11. In the future when Iotex will be the underlying base for vast number of devices how would the network/devices be affected in case of soft or hard fork if the system will need an update? Would the problems be hard to bypass with potential software transition? The way that IoT devices integrate with the IoTeX blockchain is as follows: full nodes will be run on full-power devices (e.g., normal computers, IoT gateways / routers), and light clients will be run on smaller resource-constrained devices (e.g., sensors). These light nodes will not participate in consensus (due to their lack of compute resources), but given sufficient storage resources they will be synced with a full node (i.e., the gateway it passes data to) and periodically download the latest state of the blockchain. Given a fork, the latest state of the blockchain will be pushed to full nodes, and light nodes will be automatically synced. The time has come to remember what we have experienced together in the past year, to share our moments with our loved ones and thank the people who helped us on our journey. In which we gladly shared with you our successes. It was an amazing and successful year for IoTeX. All this was made possible thanks to our amazing and passionate team and community - followers who believed in our vision, values and technology. We also want to thank each of you for your continued support and faith in our vision! IoTeX has a bright future, and we strive to transform the blockchain and IoT industries in 2019 and in the future. The next 2019 will be very important for us and our community, and as always we will share our successes and news with you. Hello IoTeX community! 2018 has been an eventful year for IoTeX — we built an amazing global community, developed the IoTeX root chain from scratch, listed the IOTX token on top-tier exchanges, aligned with innovative strategic partners, and much more. As we reflect on these milestones, we are also meticulously planning for the journey ahead. IoTeX’s next frontier will be the official kickoff of our Block Producers Program and launch of MainnetAlpha in Q1 2019. In this post, we introduce our guiding principles for designing IoTeX’s governance and crypto-economics, the role of IoTeX block producers, and the initial requirements to become a block producer. Participation and inclusivity: mechanisms will be built-in to the voting / staking process to ensure power is not centralized to a few “big player” block producers; in other words, our process will aim to prevent collusion and the formation of “cartels”. Evolution driven by all stakeholders: IoTeX block producers will be responsible for producing / validating new blocks and will be rewarded appropriately. In addition, block producers, together with all token holders and network contributors, will participate in network governance to make sure that IoTeX evolves with fairness and decentralization. Growth as a form of stake: block producers should not only consist of stakeholders with large token holdings but also those that contribute to the growth of IoTeX in other meaningful ways (e.g., community engagement, project awareness, network traffic, referrals, development of useful features and tools), especially during the initial bootstrapping phase. Sustainability in all circumstances: Instead of relying on inflation of native tokens, IoTeX employs a rewards scheme that is fair to block producers regardless of the market environment. Block producers will always be able to cover their hardware and maintenance costs. Fundamentally different from proof of work (PoW) and proof of stake (PoS) schemes, Roll-DPoS allows for massive scalability while maintaining high decentralization. In Roll-DPoS, token holders take into account computational resources, tokens staked, and several other factors (e.g., contributions, reputation, network activity) when voting for the block producers of their choice. Potential block producers are rank-ordered by the amount of votes they receive, and a pool of top vote-getters (“candidates”) are deemed eligible to join the committee of block producers for the current epoch — this is what we call the “ranking scheme”. From this pool of candidates, multiple sub-committees of block producers are randomly selected by the randomization algorithm to become block producers for the IoTeX root chain and various sub-chains. After every epoch, new sub-committees of candidates are randomly selected for block production. After being selected to a sub-committee, the primary role of an IoTeX block producer is to produce and verify blocks in exchange for rewards paid in IoTeX tokens — this is what we call the “rewarding scheme”. For more details, please see the Roll-DPoS yellow paper and this high-level video overview. A new block is produced every ~7 sec for great scalability (~3,000 TPS for each root chain and sub-chain on Testnet); block sync is fast and reliable. Committees responsible for “mining” the root chain and each sub-chain are randomly selected; within each committee, the order for block production is also randomized, providing high resilience to oligopolies / cartels, attacks, and network blips. Distinct committees are responsible for different/heterogeneous blockchains (note: this is one form of sharding). This minimizes network/computation/storage overhead for block producers. In other words, a block producer can choose to produce blocks for the blockchain that provides the highest ROI (currently the root chain) without needing to store data / maintain another blockchain it doesn’t care about. We will share comprehensive details on the ranking scheme and the rewarding scheme in two separate blog posts soon. In addition, a minimum stake of 1,200,000 IOTX tokens is required to become an IoTeX block producer. The actual amount and duration of tokens staked will ultimately impact a potential Block Producer’s ranking, as well as their associated block rewards. Please note that these are initial minimum requirements, and may be subject to change as we bootstrap the IoTeX Network. Interested in becoming a Block Producer? For those interested in becoming part of the initial set of Testnet block producers, please complete this form. Later this month, we will release a more comprehensive application for Mainnet block producers. Please stay tuned to our official channels to stay in the loop! Q1. It has been overlooked I think but in my opinion it was a very important moment when earlier in 2018 Raullen and Zhijie were teaching a distance learning course regarding Tech of blockchain and IoT at Nicosia’s university. I mean how many projects have done this by trully sincerely sharing their knowledge with new students of the field, personally I’ve only heard IoTeX doing this. Also we’ve seen that recently IoTeX partnered with University of Cincinnati. My question is whether courses like that are still being done or are being planned to be done and why is that important for team of IoTeX to allocate some of the efforts into these spaces of academics? A: First, thank you for the recognition of our academic contribution! As we stated earlier, we think the blockchain industry development heavily relies on the cryptography knowledge base. As the team with solid cryptography background, it is our obligation to explore for more innovations and make more contribution to sharing the knowledge to more talents. That’s why we also open sourced lots of our codes to the public, free to use. That’s also why we always say that there is no “real” competitor in the current blockchain industry — everyone should put lots of work exploring, researching, to strengthen the development and future killer application/ innovations regardless to do it individually or with other companies/research parties. By teaching lessons and working with academic labs, we will have more opportunities to reach more talents, speed up the innovation exploration, and all these will ultimately benefit our own development. Collaborating with top researchers in academia is also crucial for bringing the cutting-edge research innovations to the IoTeX blockchain. Q2. When looking at Iotex core’s insights at Github it can be seen that since June of 2018 there has been quite a downtrend in commits up until now with spikes in August and end of October. Should this be interpreted that the majority of the work has been done and this is actually a good sign? Any clarity please. A: Each project has its own development style. For us, we built everything from zero and finished most of the initial codes in June. Then we slowed down the commit speed intentionally. At the same time, we did several rounds of code review and code refactoring to improve the network. That’s a lot of work which will not be shown by the # of commits. (e.g. https://github.com/iotexproject/iotex-core/pull/371) So the # of commit is not the only factor to evaluate the workload. And usually, we commit our code intensively before every code release so you will see some spikes. It means that we began to freeze our code for final testing, but those codes are built gradually in the past few months. Q3. For important mainnet releases I’m sure the team will conduct various bug bounties for the community so they can potentially find any bugs and work for the hackers would be rewarded but is the team thinking of raising the stakes a bit and paying more and finding very high level hackers globally to test the robustness of the network? Would that be both technically and economically efficient and why? A: Yes we are thinking of launching another round of bug bounty program. We prefer to set a reasonable reward for the contribution since the bug bounty program is not the only way to test the network. In addition, in most of the cases, we not only give a one-time reward for the developers who helped us discovering bugs/vulnerabilities, but also keep the long-term relationship as they will help us working on IoTeX network-related works. We will also have accordance bounty program for these additional contributions. We believe raising the reward to a much higher level is not the only way to approach the high-level hackers. We may utilize a few platforms to help us spread the program details. Q4. Will the Committee of block producers be selected only through a consensus Roll-DPoS mechanism? Or will there be additional mechanisms to eliminate centralization and possible collusion? A: Yes — we are currently in the final stages of designing our block producer ranking and rewarding schemes. The ranking scheme will define how block producers are chosen, and it will not only be reliant on stake / votes but also other factors to prevent centralization and collusion. The rewarding scheme determines how block producers are rewarded for participating in consensus. We will be releasing individual blog posts on both of these schemes over the next month. Q5. What, if any, role will IoT endpoints have in maintaining consensus? Do you plan to protect the endpoint from any attempt to compromise it’s private key if it needs to be stored on an IoT device that might live in a less than secure location? A: IoT devices will not be responsible for maintaining consensus — this task is the exclusive responsibility of IoTeX block producers as our Roll-DPoS consensus mechanism is a variant of delegated proof of stake (DPoS). These block producers have minimum HW/SW requirements to ensure that consensus is processed securely and efficiently. However, IoT devices (acting as full nodes or light nodes) will be responsible for downloading the latest history of transactions so they can participate in transactions. In other words, endpoints will periodically sync the latest version of the blockchain. In addition, the security of endpoints is crucial for any blockchain-based IoT applications since the IoT endpoints are essentially responsible to provide trusted data to the blockchain. For protecting endpoints from compromise, a piece of secure hardware is highly desirable for storing private key on IoT devices. Moreover, a well-designed key management mechanism is also important to ensure the long-term security of IoT systems. Q6. Dear IoTeX Team, Wish you had (or are having!) good holidays. 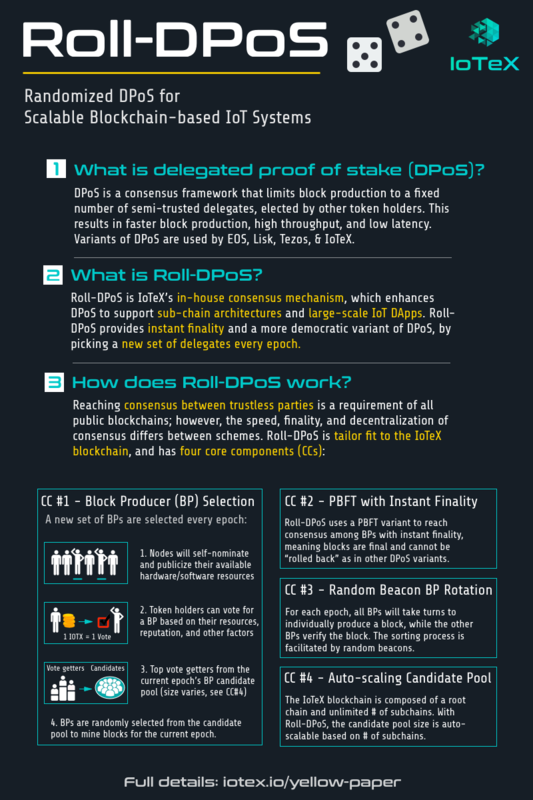 I’ve got one question about Roll-DPoS (or DPoS in general): not speaking of exact numbers/percentages/mechanisms, we know that the block rewards which a BP earns will get shared among those stakeholders who voted that BP, proportionally to their stake. But what about those who voted for all the other candidates that actually did not make it in the candidates pool? Will they be excluded by the rewards sharing? Or is it that all the block rewards from all the BPs get collected and shared among all voters regardless of who they did actually vote? Thank you. A: The sharing of block rewards from block producers to those that voted for them will not be built-in to the protocol (as is the case in PoS projects like Tezos). Instead, it is up to the block producer to determine how they will allocate their block rewards. For example, some may choose to re-distribute 80% of block rewards to those that voted for them (weighted by votes), and commit the remaining 20% to further development of the platform. We have even seen some block producers re-distribute 100%+ (i.e., they will pay more than the block rewards) to win votes. This is ultimately determined on a case-by-case basis — there may even be some block producers that do not re-distribute any funds to their voters, but will still be voted in by contributing to the network in other ways (i.e., DApp / tool builders, project awareness). As such, there will not be any defined rules requiring BPs to share / not share their block rewards. From IoTeX’s perspective, we will only provide voters with high degree of transparency as far as block producer metrics / uptime to help people make the most informed decision. Q7. Hi! How did spend holidays? 1) to you any offers from your competitors on IoTeX to technologies sometime arrived? if yes, that what? 2) in the future you plan merging with other companies? 3) we know that IoT technologies help to save significantly money to ordinary users, but further this technology will rise in price or become cheaper for ordinary users? A: Hello! The team got to spend precious time with our families over the holiday / New Year break, but we also worked diligently. We are more inspired than ever to do great things in 2019! 1/2) We do not see other blockchain companies as “competitors” and we actually work with other similar projects on research and development. We are happy to be part of the blockchain industry which is very collaborative. However, we will not “merge” with other companies but we will definitely continue to build strategic partnerships with DApp builders, investors, and other companies. Our goal is to build our community with talented and passionate companies and community members! 3) IoT technology is advancing very quickly — not only are devices / chips becoming more cheaper and powerful, but new connectivity technologies (i.e., 5G) will greatly improve the capabilities of the IoT industry. We feel this trend will continue — today’s IoT capabilities will become cheaper, but new exciting technologies will emerge at higher price points that may replace some existing capabilities as well. CES is the place where everyone who lives in the field of consumer technology gathers. For 50 years, it has been a testing ground for innovators and revolutionary technologies - a world stage in which innovations of a new generation are presented on the market. More than 4,500 companies are exhibiting at CES, including manufacturers, developers and suppliers of consumer process equipment, content, technology delivery systems, etc. Conference programs with more than 250 sessions and more than 180 thousand participants from 150 countries. Thanks to its membership in the Consumer Technology Association (CTA) ™, a technology trade association representing the US $ 292 billion consumer technology industry, it attracts global business leaders and innovative thinkers to a forum that addresses the most pressing industry issues. IoTeX is officially listed on Bittrex! We are excited to see IOTX is available for trading on Bittrex! Please retweet and win a lucky draw! We are proud to announce the IoTeX Delegates Program! Block reward (fixed): for every epoch, 24 of the 36 Consensus Delegates are randomly selected to produce blocks and receive 16 IOTX for each block mined. As an epoch is currently 8,640 blocks (one day), a total of138,240 IOTX is issued as block rewards every epoch. Hello everyone! Our next AMA with founders is coming this Friday (today) on Jan 25, 2019 from 10:30 AM-11:30 AM PST (may extend to 12:00 PM) and will be a LIVESTREAM one mainly focusing on our Delegates Program. Feel free to ask us anything about the program during the livestream! Please help share and win a lucky draw! Our co-founder Raullen, Jing and Head of Business Development Larry will be hosting the livestream to talk about our Delegates Program and Roadmap in 2019! Korea, China, Russia, Italia, Turkey, Germany, Netherlands, Indonesia, Vietnam, Spain. Wonderful experience sharing IoTeX’s tech and vision with Stanford & Tsinghua University MBA students! Our co-founder Raullen attend SBC19 and presented our recent research work focusing on "Bless-for-Reward (B4R) Authentication of blockchain States by Lightest Clients". IoTeX is on atomicwallet now! - An universal multi-assets wallet with decentralized Atomic swap exchanges. Looking forward to working closely with Atomic to bring more advanced services to the community! Hello everyone! Our next bi-weekly AMA will be a TECH one this Friday, February 8, 2019 from 2:00 PM to 4:00 PM PST. Based on our community’s feedback, we want to expand the question submit period for this AMA — you are able to submit the questions at any time from now till Feb 8, 2:00 PM PST. As usual, we will be granting 300 bonus points for up to 10 people for the “most thoughtful questions” we receive. Again, please double-check and make sure that you are submitting question with your unique IoTeX Hash ID to qualify for bonus points if selected. Any other Hash ID will be ineligible. Guys, support us, who have not had time to subscribe before - do it right now! Together we will go through the year 2019 and bring our ideas to more people and crypto-enthusiasts! Do not forget to like and comment on our social networks! We will be very pleased and recive more enthusiasm for further work! IoTeX is excited to announce the brand new Bug Bounty Program for developers! It is an open offer to external individuals to receive compensation for reporting iotex-core bugs, specifically related to security of the core functionality. Over the coming months, we will explore how to sync XYO’s geolocation capabilities with the IoTeX blockchain, allowing IoTeX developers to leverage XYO’s geolocation network. As part of this partnership, XYO will deliver a link between reality and the virtual world. XYO will use its own cryptographic blockchain network and protocols to add location verification to the highly connected yet privacy-centric IoT world which IoTeX is currently creating. Both teams look forward to the many possibilities the partnership will provide on the privacy, security and blockchain fronts. It has been a couple weeks since we shared the IoTeX Delegates Program, and we have been amazed by your interest and support! We are excited to introduce our new technical partners for the IoTeX Delegates Program - Infinity Stones, Airfoil Capital, and Metanyx. Airfoil Capital, based in Malta, are physical and digital security experts that have been involved in the cryptocurrency industry for more than 5 years. They have deep experience building and securing enterprise-grade infrastructure, as well deploying and maintaining blockchain nodes in Tezos and other networks. Their team consists of computer scientists and cryptographers with entrepreneurial backgrounds. Airfoil currently partners with Blockchange (an IoTeX partner), Ledger, Billfodl, and other key industry players. Metanyx, based in the United Kingdom, is dedicated to helping community-focused Delegates deploy and maintain highly available nodes. The Metanyx team has been involved with the IOTX developer community since June 2018, providing technical support and code contributions. Their team has rich experience in Linux server deployments and IT architecture, as well as running blockchain nodes in other networks, such as IOST. If you are interested in becoming an IoTeX Delegate and require technical assistance, you may contact: Infinity Stones at [email protected], Airfoil Capital at [email protected], and Metanyx at [email protected]. If you are interested in becoming a technical partner, please contact [email protected]. To apply to become an IoTeX Delegate, please complete this form. Video Campaign: Watch our new Delegates Program video and help spread the word by sharing with your friends. More referrals = more points! Signature Campaign: Wear IoTeX signature and be active in popular blockchain forums to promote our Delegates Program. Big rewards for reputable members like you! Quiz Campaign: One of the most popular campaigns we have with our community — show your knowledge of the Delegates program in an interactive quiz! Creative Content Campaign: Share your creativity and passion for IoTeX via pictures, videos, songs, or other content — it’s up to you! The creations with the most re-tweets / shares and the IoTeX team’s favorites will earn BIG rewards! Voting Portfolio Campaign: Create your own mock voting portfolio to familiarize yourself with the IoTeX voting website. Use different token amounts / stake durations to customize your votes and get points for every portfolio you create! Also, BIG daily lucky draws — stay tuned! Rewards for Early Voters: This is the HUGE campaign you have been waiting for! We will be giving out millions of IOTX to reward early voters once the voting process starts. The more votes you make, the more rewards you will get, so make sure to accumulate points in our earlier campaigns! You will receive lots of bonus rewards for consistent participation. The more campaigns you participate in, the more bonus rewards you get! We are so happy to reward our community for their support, and hope that everyone participates in these campaigns to learn the voting process and benefits before voting officially starts at the end of February. We will be announcing the official dates and detailed instructions for each campaign on our official channels — stay tuned and don’t miss out on the fun! Our next bi-weekly AMA will be a GENERAL one this Friday, February 22, 2019 from 2:00 PM to 4:00 PM PST. Just like last time, in order to accommodate our global community in all the different time zones, we will be accepting questions starting from now until Feb 22, 2:00 PM PST. The thread will be locked at 2:00 PM on February 22, 2019 and we will answer the questions one by one till 4:00 PM PST. If you have follow-up questions, please feel free to comment on our reply! There is one very concrete research problem we are investigating and were faced with when started doing IoT-DApps. So the problem is how the blockchain can authenticate each state of a client, since the client is so lightweight (we call it lightest client), it has no previous states of the blockchain and also it has very limited computation, storage and network resources. How can this be done cost-effeciently and in real time? next month and we can discuss all the details when it's out. While we are extremely focused on launching the Mainnet and IoTeX root chain, we are always thinking ahead about the bigger picture of IoTeX Network for the next 5–10 years. Our long-term design employs Separation of Powers, a term coined by Charles-Louis de Secondat, which states that political authority should be divided into legislative, executive and judicial powers. Inspired by this concept, the grand vision for IoTeX utilizes four layers with unique roles. Governance layer, instantiated by the Gravity Chain (i.e., no one can see it but it governs everything in the universe), is the layer that acts as a decentralized government for the IoTeX network. It uses a liveness-oriented consensus scheme (e.g., PoS variant) to facilitate tasks such as staking, voting, slashing, protocol-related proposals, and more. It is a critical component required to ensure high reliability, throughput, and transparency, and will be launched in Q3/Q4 2019. Orchestration layer, instantiated by the Root Chain, is the general manager and coordinator for all subchains. It is powered by our safety-oriented Roll-DPoS consensus mechanism and aims for high throughput and reliability. This orchestration layer (i.e., the root chain) will be launched in Q1 2019 (i.e., Mainnet Alpha). Operational layer, instantiated by various subchains, is the concrete unit that handles business logic related to specific use cases / applications (e.g., supply chain, smart city, data exchanges. In IoTeX’s design, subchains share the same pool of Delegates as the root chain, so anyone can spin up a subchain as effortlessly and securely as spinning up an EC2 instance on AWS Cloud. The first IoTeX subchain (codename: Avo Chain) is expected to be launched in Q2/Q3 2019, which will be focused on privacy. Execution layer, is an optional layer for specific subchains. For example, Avo Chain Delegates (i.e., block producers) will have to offload privacy-preserving computation tasks to certain devices for execution. Many DPoS blockchains (e.g., EOS, Lisk) manage staking/voting on its core operational layer blockchain, which is somewhat risky. Staking/voting is a special type of governance task, which we believe should not be grouped with operational tasks. For example, elected Delegates, as a vested interest group, may disregard staking/voting transactions in the block production process to mitigate being de-elected (i.e., conflict of interest). Furthermore, elected Delegates may enforce protocol upgrades (by upgrading their software without consent from other users) that are not favorable to the rest of the ecosystem. IoTeX believes deeply in decentralized governance; therefore, tasks such as staking/voting should happen outside of the operational layer. But what are we gonna do before our governance layer (Gravity Chain) is ready? The answer is simple — use Ethereum as the governance layer for now, as our circulating IOTX token (ERC20) is already compatible with Ethereum! Ethereum is a liveness-oriented blockchain that has moderate performance and high reliability, which is suitable for playing the role of the governance layer until the gravity chain is ready. After a few months, the staking/voting and other governance processes will be fully migrated to our Gravity Chain. So, how will the interaction between IoTeX and Ethereum work essentially? To stake/vote, users send the current ERC20 token to a smart contract deployed on Ethereum. IoTeX blockchain nodes (running iotex-core software) will periodically pull the state of this contract (call it a “rank feed”) from Ethereum to determine the Delegates and respective rankings for the current and next epochs. Rewards for Delegates are based on the rank feed and will be distributed on the IoTeX blockchain in the IoTeX native token (not ERC20). The native token will be used to run transactions and execute smart contracts on the IoTeX blockchain. To facilitate the conversion of native tokens to ERC20 and vice versa, we have prepared a two-way token swap service. ERC20 tokens, which will remain trading on exchanges, can be swapped for native tokens (1:1 swap) to run transactions on IoTeX blockchain. Native tokens, which will be given as Delegate rewards, can be effortlessly swapped for ERC20 tokens to stake/vote or trade on exchanges. To streamline the staking/voting process, we have developed an easy-to-use webtool on the IoTeX website. The webtool is integrated with MetaMask and the Ethereum voting smart contract for a clean user experience. Please note the IOTX you wish to stake must be transferred to the webtool wallet and a small gas fee in ETH is required to vote. We will provide a step-by-step video of the voting process, as well as a comprehensive Voter’s Handbook in the coming week. Until then, be sure to participate in our upcoming Community Reward Programs to familiarize yourself with the voting process / webtool and earn points! Second round of technical partners for the IoTeX Delegates Program : Staked and EON! Staked operates the most secure, performant, and cost-effective block production nodes for decentralized PoS protocols on behalf of institutional investors. Their multi-tier signing and listening node architecture delivers stakeholders the ideal combination of security, scalability and decentralization. Their team has a long and successful track record of starting, building and operating web services at companies such as Vimeo and InterActiveCorp. Staked currently operates nodes for many PoS/DPoS networks such as Decred, Tezos, Cosmos, EOS, Loom, and Dash. EON is a full-service staking and validation provider that is securing the emerging staking economy. EON’s end-to-end Staking-as-a-Service (StaaS) manages security and technical complexities, enabling token holders to safely participate in block production and validation. EON provides a robust and secure institutional product that is efficient, reduces risk, and provides great user experience. Their state-of-the-art technology is offered at a low cost and has been proven in several PoS/DPoS networks, including EOS and Tezos. Today, we are excited to introduce you to our first set of 36 Delegate candidates via a fun and interactive Vote & Share Campaign. On top of the IoTeX-sponsored daily Lucky Draw, Delegates will be announcing special campaigns in their official channels to attract/educate voters on their unique stories, expertise, and plans for the IoTeX network. 🎁️Don’t miss out! Encourage your friends, family, and network to participate — we will give additional 2x points bonus if we have more than 1,000 participants each day! The winners will be randomly selected EVERY DAY at 4:00 PM PST. The more delegates you supported, the higher possibilities you will be selected as a winner! While we work with our development partners to build new tools / DApps, we are also onboarding new ecosystem partners to bring new capabilities to IoTeX. Today we are excited to announce our new ecosystem partners and IoTeX Delegate candidates: Cobo Wallet, CoinGecko, DRoute, and HashBuy! We have had an amazing time working with our 20+ brand ambassadors this past year, and are proud that many will take the next step by becoming IoTeX Delegates! Here we are excited to announce our IoTeX Brand Ambassador Delegates: GameFantasy, IoTeX Core, IoTeX LAB, IoTeX Trader, iotxplorer, and LongZ! Hello everyone! Our next AMA with founders is coming this Friday on Mar 1, 2019 from 11:00 AM-12:00 PM PDT (may extend to 12:30 PM) and will be a LIVESTREAM one mainly focusing on our Delegates Program. Feel free to ask us anything about the program progress during the livestream! Our co-founders Jing and Raullen, and Head of BD Larry will be hosting the livestream to communicate with our supporters and to let you know more about the IoTeX recent updates! Like last time, we will take the first few minutes to walk through the current progress with more details. We will have a mix between discussing pre-selected submitted questions and answering the questions you have for them live. Today, we are excited to announce our new ecosystem partners and IoTeX Delegate candidates: BlockBoost, BlueFox IoT, National University of Singapore, and Stanford CPC! After a busy 2018 of #buidling, IoTeX is ready to bring our technology to the real world in 2019. This journey cannot be completed alone! While we work with our development partners to build new services, tools, and DApps, we are also actively onboarding new ecosystem partners to bring new capabilities to IoTeX. By contributing their unique expertise (i.e., tech, economics, distribution) to IoTeX, our ecosystem partners expand the reach/possibilities of the IoTeX blockchain, DApps, and ecosystem. In the past year, we have onboarded several ecosystem partners focused on security and scalability (i.e., CertiK, Celer). But that’s not all that is needed for a thriving ecosystem! We also need: global media and branding expertise, connections to IoT enterprises, advanced research into real world applications, community building in various regions, and more. We are proud to announce our first batch of developer groups who are running as IoTeX Delegates: Consensus Networks, IoTASK, iotexhub, Super IoTeX, and WanNodes! IoTeX is an open source network — an experiment in mindshare and collaboration, where the whole is greater than the sum of its parts. Although much of the research and development of IoTeX thus far has come from the core team, a new era of IoTeX is coming soon. We are ready for diverse groups of developers to take the lead on building tools, services, and dApps using the infrastructure and features of the IoTeX Mainnet. It is now time to officially deliver IoTeX to the true owners: the IoTeX developer community and users! The goal of IoTeX from Day 1 has been to provide a secure and feature-rich platform to enable new blockchain-powered IoT and privacy use cases. Step 1 of creating a state-of-the-art blockchain will be realized with the launch of Mainnet Alpha. The next steps of adding open source tools (i.e., SDKs, explorers, wallets) and new dApps / services (i.e., DEX, stable coins, oracles) will involve the entire IoTeX developer / user community. We can’t wait to see what you will build on the IoTeX network! We are proud to announce our secon batch of developer groups who are running as IoTeX Delegates: Crypto Lions, IoTeXTeam, IoTeX Geeks, iotexmainnet, Keys IoTeX, and Slow Mist! CryptoLions is a team of IT infrastructure, computer science, and security experts based in Ukraine and Germany that are deeply ingrained in the European developer community. They are well known for their respected position in the high-profile developer communities, curating many initiatives such as EOS Jungle Testnet. They hope to be the bridge between IoTeX and their wide range of networks, including EOS, European enterprises via the Europe Chain initiative, and the broader Eastern European developer community. As an IoTeX Delegate, CryptoLions hopes to be among the most reliable, responsive Delegates and help incubate high impact projects in the IoTeX ecosystem. See CryptoLion’s full Delegate profile here. IoTeXTeam is part of StakingTeam, a dedicated delegation service and developer organization with years of experience and a strong commitment to IoTeX. Their team is dedicated to cryptocurrency 24 hours per day — blockchain isn’t their part-time hobby, it’s their world! Their team consists of financial / economics experts, infrastructure managers, and executive-level businessmen, who combine their skills to create a holistic Delegate operation. As a Delegate, IoTeXTeam will work closely with IoTeX to help bootstrap the Mainnet, providing high-touch service to community members. As they love to say: “The most powerful force in the universe is compound interest. Followed by staking!” See IoTeXTeam’s full Delegate profile here. IoTeX Geeks is made up of developers who will run a stable node and develop a community wallet that is specific for the IoTeX network. Their team is made up of developers who are experienced in developing blockchain technology, especially in other high-profile blockchain networks. With the motto of “IoTeX wallet by the community, for the community”, IoTeX Geeks will make it simple and secure to interact with the network and other users via an IoTeX wallet. As an IoTeX Delegate, they also plan to engage with the community and take all requests for product features into consideration. Their wallet will be open source and made for the community. See IoTeX Geek’s full Delegate profile here. Iotexmainnet is a team of strong technology specialists with a large technical base, administrative resources, and support of their local Russian government. As a team, they strive towards popularizing IoTeX among the Russian-speaking community and hope to bring IoTeX technology to the real world. As an IoTeX Delegate, their main goal is to bring the adoption of the IoTeX technology and products to Russia and it’s population. They firmly believe that they have everything needed, including technology, marketing, and business, to reach a global audience in order to nourish and expand IoTeX. See iotexmainnet’s full Delegate profile here. Keys IoTeX is led by Burak Ordu, a veteran in the financial services industry for major banks including Capital One, SunTrust, and Citizens Bank. With specialties in data analytics and computer science, Keys IoTeX has been involved in the blockchain space since early 2014. Keys IoTeX will provide highly secure infrastructure services for blockchain networks and plans to increase awareness of the IoTeX blockchain by running educational and promotional campaigns. They fundamentally believe that IoTeX will revolutionize the Internet of Things (IoT) and hope to secure and strengthen the decentralized future of the IoT ecosystem. See Keys IoTeX’s full Delegate profile here. SlowMist is headquartered in Xiamen, China and was founded by a team from Google, Microsoft, W3C, Tencent, Alibaba, and more. They have more than ten years experience in first-line network security attack and defense. The core competencies of SlowMist include security auditing and blockchain threat intelligence, and they run security audit and defense for many well-known global exchanges. SlowMist continuously provides threat information to partners and relevant national authorities using their unique underground hacker wind vane tracking engine. SlowMist has audited more than 400 Ethereum smart contracts and has created EOS Monkit, DApp firewall FireWall.X and other products. See SlowMist’s full Delegate profile here. We are excited to have the support of some of the most influential investors and funds in the blockchain industry: 8 Decimal Capital, Alphacoin Fund, BlockVC, DraperDragon, DU Capital, IOSG Venture, PreAngel, Royal Land, Whales Capital, Youbi Capital, and ZH Capital! Spoiler: Investing in IoTeX’s Future as Delegates: 11 Investors & Funds! 8 Decimal Capital is an international professional blockchain investment institution, which manages two USD and token funds, The team consists of representatives from front-line VC, PE, and financial institutions. They have been rated in the Top 10 blockchain investment institution by 36 Krypton, Tsinghua X-lab and others. See their full voting profile here. Alphacoin Fund is a venture capital fund focused on investing in blockchain technology and tokens. Since 2017, AlphaCoin has invested in over 50 leading blockchain technology projects both at home and abroad. Their team consists of professionals from China, Singapore, and Silicon Valley, bringing know-how and engineering capability. See their full voting profile here. BlockVC is an acknowledged leader in the blockchain industry and is committed to the pursuit of new opportunities. They have an underlying exposure to 1 VC fund and 2 eco-funds in their portfolio of more than 60 projects. They focus on mapping investment themes in a systematic manner, and they offer full life-cycle solutions including incubating and asset management to their portfolio that have global impacts. See their full voting profile here. DraperDragon & Homotopic is a joint effort, including DraperDragon Innovation Fund mainly focusing on USA-China cross-border startups. DraperDragon currently manages several RMB, USD, and Digital currency funds. In the blockchain sector, DraperDragon participated in the early investment of several leading projects, including IoTeX, Ledger, and Telegram. See their full voting profile here. DU Capital is a seasoned blockchain investment firm based in Singapore. Today, it has invested in many renowned projects such as IoTeX, Polkadot and Sovrin and is still actively looking for its next venture. With rich experience and strong connections, the firm is devoted to growing projects to help change the world and make it a better place. See their full voting profile here. IOSG Venture has ten years of history in traditional technology investments. Among their upcoming focus areas are private computation, Web3, and token engineering. As one of IoTeX‘s close support partners, they are very optimistic about the development and future of IoTeX. They plan to help build better and safer IoT applications and ecosystems. See their full voting profile here. PreAngel was founded in 2011 and has invested in more than 300 companies in China and USA, covering a range of industries such as Mobile Internet, Smart Hardware, Healthcare, E-Commerce, and more. PreAngel will help IoTeX build a strong community from the business side, utilizing their network in multiple industries to drive IoT technologies. See their full voting profile here. Royal Land is a pioneer venture capital firm focused on the blockchain technology sector. They back and work with innovative entrepreneurs to reimagine the world. Connecting Silicon Valley and Asia, they leverage their local networks & resources to support visionary entrepreneurs who move fast, think big, and are committed to reimagine the world. See their full voting profile here. Whales Capital is a professional Venture Capital fund which mainly focuses on blockchain. They seek companies or projects with big market, leading technology and talented team. They believe in value investment and empowerment investment. They want to grow together with their projects and provide a lot of resources for them after investment. See their full voting profile here. Youbi Capital is a major token holder of many prospective public blockchains that rely on Proof of Stake. They are strongly motivated to protect the robustness of the network, and the foundation of value. We would like to use our expertise and position as an early investor to extend new opportunities in staking to the retail investors in the community. See their full voting profile here. ZH Capital is a young and blooming capital firm with a strong focus on asset management, OTC trading, and cryptocurrency. Their core competency is providing liquidity as an options market-maker. To do this successfully they design and implement their our own low latency technologies, trading strategies, and mathematical models. See their full voting profile here. The coming launch of Mainnet Alpha represents the help and support of the entire community, which includes our investors. We look forward to seeing the great new opportunities that will arise in the future. We are so excited to have this second batch of developer groups on board, and we can’t wait to work closely with them to drive the future development of the IoTeX blockchain and wonderful things that will be powered by it. Check out our previous blog post on the first batch of developer groups here. If you are interested in contributing to IoTeX development, please join our Github. If you are interested in becoming an IoTeX Delegate, please complete this form. Got some IOTX tokens sitting on an exchange or in a hardware wallet? Before voting for Delegates begins on March 11, you can put your IOTX tokens to work! Starting today, you can stake your tokens and earn 20–30% annualized returns — the sooner you stake, the more rewards you will earn! IoTeX uses Roll-DPoS, where Delegates “prove their stake” by committing resources (i.e., time, HW, tokens) to the IoTeX network. Voters also stake tokens to endorse one or more Delegates and receive a share of the Delegate’s rewards. As a voter, staking makes the IoTeX network more secure and efficient, and also earns you rewards on your IOTX tokens! Today, we are releasing a standalone staking tool to help you prepare for voting on March 11. That means you should collect your IOTX tokens from various exchanges/wallets and start staking today! For more details, please see our Voter’s Handbook. Why should I stake now? 30% annualized returns on staked IOTX with ≥28 days stake duration (i.e., staked until Mainnet). Limited spots available! Remember that after Mainnet begins, voters are eligible to receive 20%+ annualized rewards from Delegates for voting. Until then, IoTeX Foundation will provide the rewards as a thank you to the community. The sooner you stake, the more rewards you will earn, so stake today! Install MetaMask — this will be the bridge between your ETH wallet and the IoTeX staking/voting smart contract. In MetaMask, create a new ETH wallet or import an existing ETH wallet using your private key, Ledger, or Trezor. 4. Visit the IoTeX Delegates website and click “Stake Now!”. You will be prompted to install MetaMask — please install before continuing. 5. To stake, choose an amount of IOTX, stake duration, and auto-stake on/off. We recommend dividing the total amount of tokens you wish to stake into multiple buckets, as each bucket can be directed to vote for one Delegate. For each bucket, input the # of IOTX you wish to stake and a staking duration. 1 IOTX = 1 Vote and bonus votes for setting a stake duration. Your bonus votes will reduce every day and eventually converge to zero when the stake duration expires (you will still have 1 IOTX = 1 Vote). You may also choose to “auto-stake”, meaning your bonus votes will be retained indefinitely until you turn off auto-stake. 6. You will be prompted to confirm the staking transaction. You will see the # of IOTX tokens, your wallet address, and start/end dates for staking duration. 7. To complete the transaction, you will need to confirm the smart contract in MetaMask. Be sure to use our recommended gas limits to save on gas fees! #2: Verify the actual transaction — please ignore the “ALERT: Transaction Error” dialog and press “Confirm” (right screenshot). 8. Congratulations! You have successfully created a staking bucket. You can visit the “My Votes” page to see all of your buckets or create a new bucket. It’s time to collect all of your tokens and start staking with our new MetaMask webtool! If you are interested in staking without MetaMask, we will provide instructions soon; however, we highly recommend everyone to use our webtool as designed. Voting for Delegates will begin on March 11 — just one week away! Please use this next week to gather your tokens from various exchanges and wallets so you can be ready for the big day. Stay tuned to our Telegram to stay in the loop during this exciting next month for IoTeX! Video from iotexlab.io: "IoTeX Staking Process"